Wausau Canvas Company offers a full range of seaming or welding options for your fabrics. In addition to traditional sewn seams, we offer RF(radio frequency welding), Hot Air and Hot Wedge thermal fusion welding. The methods are summerized below. RF or radio frequency seaming/welding, uses radio waves similar to your microwave to pass through the fabric creating heat and fusion while under pressure. The radio waves travel across a die (metal such as aluminum or brass) through the material and back to the deck plate to complete the circuit. There is no smoke produced from RF welding. Many materials have a good "resistance" to radio waves and work best for this method, these materials are PVC (vinyl) including film, coated and laminated vinyls, polyurethane and others. Fabrics like PE (polyethylene) have little or no resistance and usually require special buffers to create a bond. Materials that are not RF sealable can usually be sealed with hot air or wedge welding if they can be melted. RF welding creates heat inside the fabric by "flipping" the molecules from positive to negative thousands of times per second. This creates friction heat from the inside out, the materials are lapped and under the pressure of the die which causes those areas of the fabric to be sealed together. A bar seal is the most common die, this welds fabric panels together much like a sewn seam would. Truck tarp seams are an example of RF welded seams although hot air and wedge welding are faster in this application. Common products that are RF sealed using other die shapes are plasma bags in hospitals and 3 ring binders were the vinyl jacket is sealed and cut in one step. Many clear "blister packs" used in product packaging are RF sealed. Car manufacturers use RF to seal the seat details into the upholstery. The size of the machines in Kilowatt output determines the size of the sealing area it can do. RF generators range from 3K to 50K or more with the most common being 10-20K machines. Custom dies an be machined for almost any shape or seal required. A RF seal produces the best quality seal in appearance and bond. 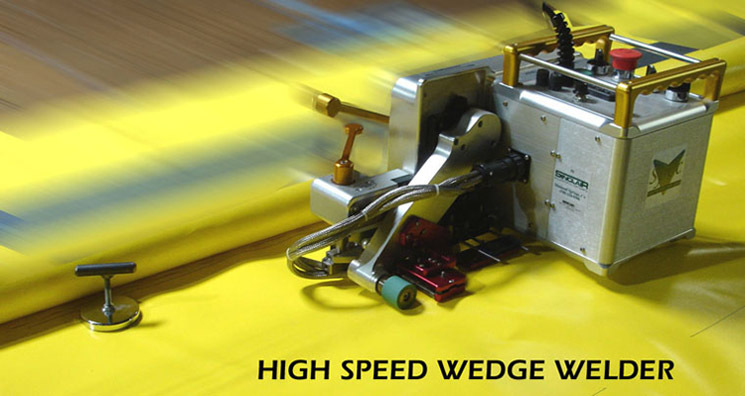 Wedge welding is generally used to seam panels of fabric together. Seam width is determined by the width of the hot wedge. Common sizes are 3/4 " through 2 inch widths. 1" or 1-1/2" are the most commonly used for such products as tarps, curtains and awnings. Wedge welding has an advantage over Hot Air welders in that they produce little or no smoke when used ( some smoke may appear as residue on the wedge is burned off). Wedge welding is most efficient when used for long seams as the wedge welder generally travels along the material in a track which is built into a table or on the floor. Once in postion, the material does not have to moved as it is welded. Large covers for ball fields, swimming pools and gymnasiums as well as geotextiles are excellent candidates for wedge welding as speeds of 50-60 feet per minute can be achieved. Wedge welders use a tapered metal "wedge" with heating elements implanted in the body to create the heat. There is an upper and lower material guide, one for each of the two fabric panels.One piece of material is passed above and the other below the hot wedge at a predetermined speed, the fabric is partially melted by contact with the wedge. The two fabric panels are then immediately passed under a set of silicone "pinch" rollers which apply pressure to the hot materials and roll them out the end of the machine. The material is now sealed and bonded under pressure creating the finished seam. Each type and weight of material must be tested to determine the optimum speed and temperature for a proper seal. Projects with large panels are best suited for wedge welding. Hems and pockets can be done on a wedge welder with a special folder attachment. Awning and marine fabrics such as Acrylics can be lap seamed with the use of welding tapes. Hot Air Welding uses a nozzle to blow heated air between two layers of fabric. There are several types of hot air welders ranging from hand held units that resemble large hand held hairdryers to table mounted units complete with material feed systems and long arm extensions for large panels. The smaller hand held units are used for localized welding such as bench work or repairing vinyl tarps or membrane roofs. The stationary units are built into tables or workstations with feed controls for the fabric speed and digital controls for tmperature at the nozzle. These units operate from 200-600 degrees C or more. Most common fabrics seal between 300-450 degrees C. These units typically can weld fabric at rates of 20-40 feet per minute. The two panels are fed through metal folders spaced at the desired seam width and lapped at the nozzle. The nozzle swings in between the fabric layers and blows the heated air in between the layers just before they pass through a set of pinch rollers. The fabric is slightly melted and pressed together as it goes through the rollers, the result is a thermal weld. This method is very effective for production welding of tarps and large paneled products. The disadvantage is there can be smoke produced when reaching proper welding temperatures. Newer units have minimized the smoke or have exhaust systems to protect the operator and work area. Hot air welders with nozzles mounted to arms or posts can be used to weld irregular shapes that can not been done by wedge or RF welders. Shapes such as circles or parts with multiple angle changes can be easily welded. This is the greatest advantage of these hot air units. The factors that determine the best method for seaming or welding a product are what material you are using, desired seam appearance, size of the product (do you have short welds of a few inches or welds that are 30 feet or more long?) , strength needed in the seam, volume of work and speed required. The strength of the seam can easily be overlooked. When working with coated or laminated products such as PVC (vinyl) , it is important to know that the strength of the finished weld is determined by the adhesion or tear rating of the material to the substrate (scrim). This is often 10-15 pounds per square inch. If the material is over heated during the welding process, you can actually "de-laminate" the coating from the scrim. Over heating can cause seam failures. Even if the vinyl is welded together, one side of the vinyl can tear off the scrim if over heated. When you see seam failures and all the vinyl is on one side of the seperation, this is indicative of overheated seams. The best weld will allow you to tear parts of material off of both sides of the weld when tested. When seaming fabrics like wooven acrylics, the bond occurs by melting the welding tape between the material layers. The tape "liquifies" and works into the weave, then rehardens creating the bond. This seam is adequate for most applications in awnings and marine work, the seperation strength is low but most force in the field is applied in-line(stress is vertical and horizontally along the weld) were this method provides a strong bond. The ends of the seams must be closed by hemming or other mechanical closure methods to keep panel from being torn open. Ultra-sonic welding is also used for welding synthetic material. A vibrating horn is used to send high frequencies throught the fabric and creating a bond. These machines are available in table mounts and as "sewing machines" without the tread and needles. Material are passed under the foot were the horn welds the materials on the move. Please contact us for any questions you may have about using any of these seaming/welding methods. Thank you.